ASHLEY NGUYEN TTN Carolyn Parkes works in housekeeping at St. Joseph’s University but only gets called in when she is needed. Parkes did not negotiate her pay when she was hired. 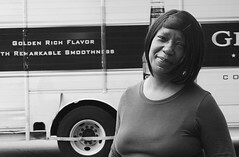 Parkes, who is from North Philadelphia, is employed by St. Joseph’s University’s housekeeping department. Parkes operates on a “flex” schedule, meaning she is on-call and can’t depend on a steady number of hours each week. Citing the better pay as reasoning for not negotiating for a higher pay, Parkes said she works hard with hopes that her bosses will eventually take notice and offer her a more stable paycheck. To make ends meet, Parkes also babysits, but with four grandchildren, her hands are already full.